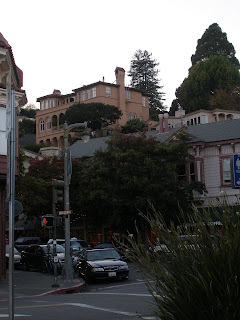 Sausalito is a small town on San Francisco Bay that I've been wanting to go to for several years. This time I finally made it. It is a cute, quaint little town that is filled with boutiques, bars, and restaurants. 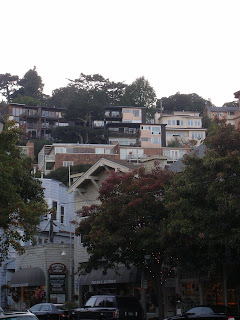 The houses are all built up the hillside, with a few at ground level across from the Bay. The streets are steep, as is the price of the real estate, but the views are worth it. This is a good town for walking or biking. 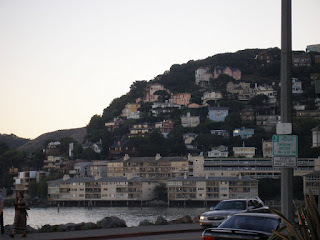 You can either drive over the Golden Gate Bridge (take the first exit) or take the ferry from San Francisco (either from Fisherman's Wharf or the ferry terminal) in order to reach Sausalito. From San Francisco you can also bike over the bridge either on your own or on a guided bike tour with Bay City Bike. While in Sausalito my boyfriend and I stopped at The Spinnaker for drinks and a shrimp cocktail. The Spinnaker is located on the bay (built out on piers) with floor to ceiling windows and a panoramic view. We then walked back to the main street of town and checked out some of the shops. The shops range from typical tourist type shops to high end art galleries. Then we each got an ice cream waffle cone from Lappert's, a small, premium ice cream chain...it was some of the best ice cream I've ever had. 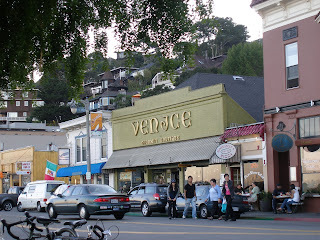 There are many dining and drinking options in Sausalito...so come hungry and thirsty! There are also several hotels you can stay at in town...I plan to stay at one of them on my next trip to California.